The implication in a number of the articles is stock buybacks increase a company's stock price and therefore buybacks are being used to increase the value of senior management stock options. In short though, buybacks have no direct impact on the value of a company's stock price. The below table shows how the share price is unchanged. 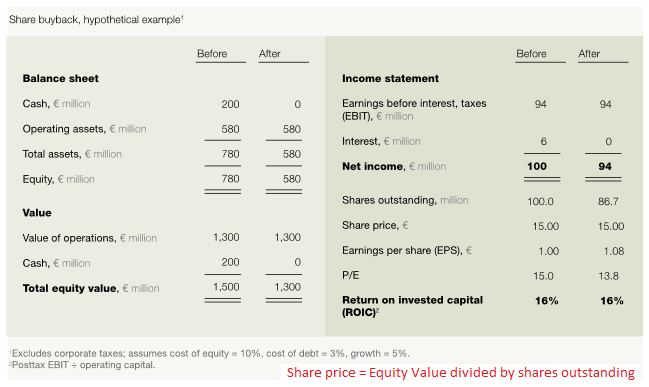 What can occur is the earnings per share figure can increase due to the lower share count. Other examples are contained in our post, Proof Buybacks Impact Earnings Per Share. We believe the market is intelligent enough to see through this type of earnings manipulation; thus, not attaching additional value for a firm's stock price due solely to stock buyback activity. 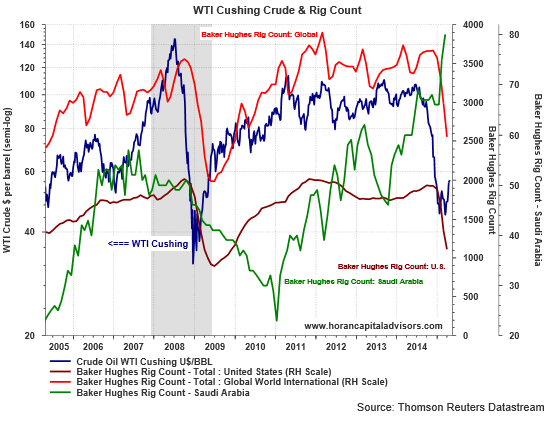 Oil rig count has fallen dramatically in the U.S., yet oil supply is continuing to pile up nearly unabated. 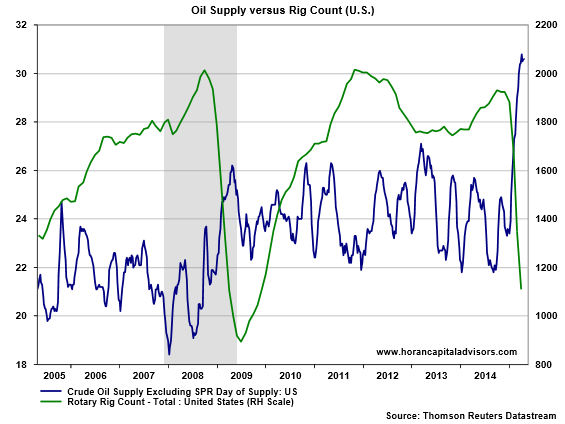 The market is of the belief that this decline in rig count will ultimately put a halt to the supply growth. Rex Tillerson, CEO of Exxon Mobil (XOM), recently spoke at the IHS CeraWeek conference in Houston, TX. Tillerson believes oil prices are likely to remain at a lower level for the next several years. Additionally, ConocoPhillips (COP) CEO noted the shale fracking industry has a large number of wells that will be completed once oil prices do rise. This alone is likely to place a cap on the rise in the price of oil. Lastly, as the below chart clearly shows, in spite of the lower level of oil prices, Saudi Arabia is determined to keep the supply of oil flowing as evidenced by the country's rig count growth (green line.) Their goal is to force fracking companies out of business in an effort to eliminate this swing supply. "The string of inventory builds continues for oil, up a fat 5.3 million barrels in the April 17 week to 489.0 million which is the 14th straight build and yet another 80-year high [emphasis added]. The build is due to yet another rise in oil imports and also in part to an easing of refinery demand for oil. But refineries are still busy, operating at 91.2 percent of capacity." 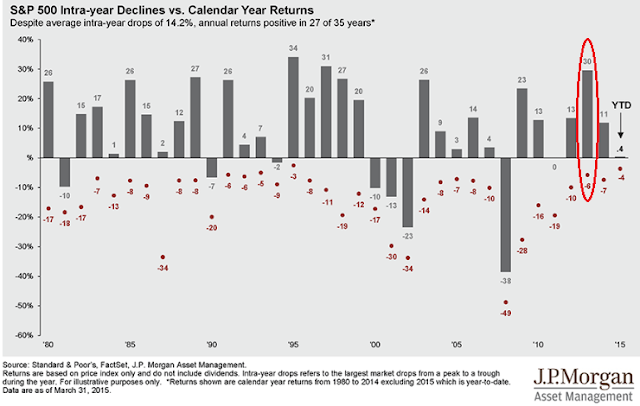 Investor Letter Spring 2015: Another Weak First Quarter? The first quarter of 2015 once again was a period where reported data suggests a mixed economic picture for the global economy. Interest rates declined slightly leading to positive returns for nearly all U.S. bond market segments. This was once again influenced by lower yields outside the U.S. and the strengthening Dollar. Worries about an economic slowdown have resulted in Europe, Japan and China incorporating additional economic stimulus via interest rate decreases and bond purchase programs. For many investors, the prospect of weak economic news is good for equity markets as central banks pursue stimulus programs to reinvigorate economic growth. 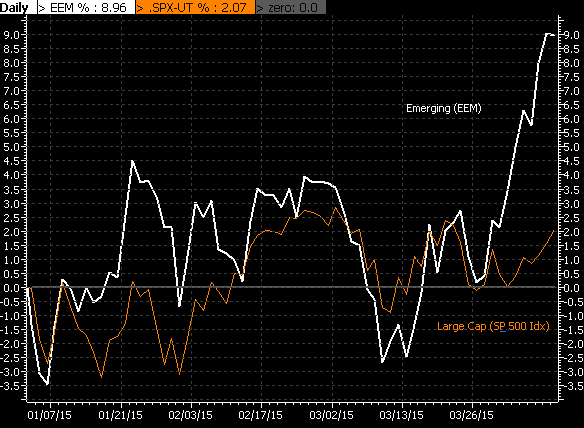 Stimulus seems to create a floor for equity markets as liquidity finds its way into the market. As we noted in our blog post yesterday, Higher Yield and Value Oriented Strategies Underperforming Broader Market, the additional investor demand for these yield oriented equities, i.e. 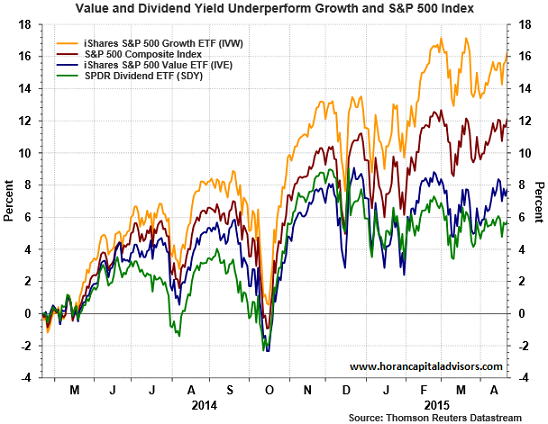 dividend growth stocks, has not resulted in higher returns. Also, Goldman Sachs notes in a recent report that the dividend yield, high quality and strong balance sheet companies have been weaker performers versus other more growth oriented strategies. The below charts provide evidence of this phenomenon. Looking specifically at economic growth or GDP, the Federal Reserve Bank of Atlanta notes the weakness in GDP in each first quarter since 2010. Some attribute this first quarter weakness to poor weather. However, the Atlanta Fed notes seasonal adjustments since the Great Recession could be negatively influencing first quarter GDP reports as well. As the chart at left shows, weaker economic activity in the first quarters since 2010 is very apparent. The average GDP growth in the first quarter since 2010 has been .6% versus 2.9% for the remaining quarters of the year. The advance estimate for the first quarter of 2015 will be reported on April 29th and the Fed’s tracking of data shows Q1 2015 GDP at just above zero. For additional insight into our views for the market and economy, one can read our Investor Letter accessible at the below link. One interesting aspect of the recent equity market advance has been the investor focus on higher quality dividend growth equities. A result of investors' search for yield is many of these higher yielding equities are trading at the higher end of their historical valuation range. Also, given the heightened focus on yield, one would expect the higher quality dividend growth equities to have outperformed the market over the past year. However, as the below chart shows, the SPDR Dividend ETF (SDY) has generated the worst 1 year return versus the other three comparison investments. The second worst performer is the S&P 500 Barra Value Index. Although investors have pursued higher yielding investments in this low yield environment, the higher demand has not resulted in higher returns. The underperformance of higher quality and higher yielding investments may be a shorter term phenomenon, but investors simply need to be aware that pursuing higher yield/higher quality strategies can result in lagging performance if only in the short run. On the other hand, in a market correction higher quality and higher yield equities tend to outperform the overall market. Is This The Beginning Of A Larger Equity Market Correction? Awaiting the 10% equity market correction seems to be on the minds of a number of strategists as soon as the market begins a turn lower. The last correction of greater than 10% occurred in 2011 when the S&P 500 Index declined nearly 20% between July and October 2011. Since March 23rd through Friday's close, the S&P 500 Index has declined 43 points to 2,072 or a decline of just 2%. In the first week of March, the S&P fell 3.5% before rebounding. An important support level has been the 50 day moving average; however, when this level is violated, the 150 day moving average has served as strong support for the market. As can be seen in the below chart, the S&P 500 Index closed below the 50 day moving average on Friday. 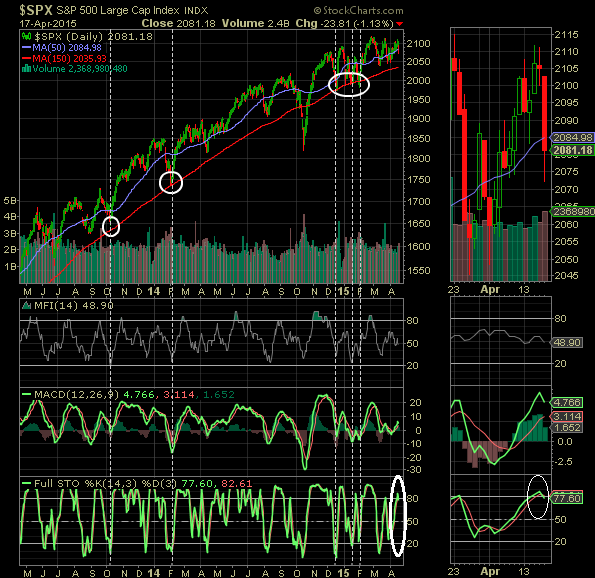 What appears important about the technical set up at this point is the stochastic indicator is just now showing an overbought level for the market. In prior 50 day moving average violations, the stochastic indicator did not show as oversold until the market found support at the 150 day moving average. 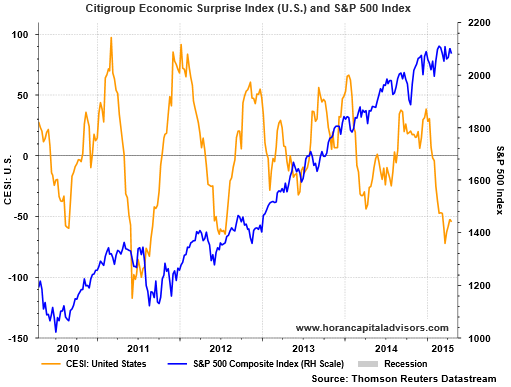 "The Citigroup Economic Surprise Indices are objective and quantitative measures of economic news. They are defined as weighted historical standard deviations of data surprises (actual releases vs Bloomberg survey median). A positive reading of the Economic Surprise Index suggests that economic releases have on balance [been] beating consensus. The indices are calculated daily in a rolling three-month window. The weights of economic indicators are derived from relative high-frequency spot FX impacts of 1 standard deviation data surprises. The indices also employ a time decay function to replicate the limited memory of markets." "It is important to understand, though, that the surprise index doesn’t rise or fall with the ebb and flow of the economic cycle. Because it measures a rolling average of how things turn out relative to forecasts, more often than not it tends to turn negative after there has been a streak of encouraging economic news, such as in late 2014. This is because forecasters often mistakenly extrapolate recent trends." "When the index is deeply negative, as it is today, that is usually a good sign for stocks. Following the weakest 5% of observations since 2003, the S&P 500 rose by 14.4%, on average, during the following six months. Conversely, it rose by just 5.5% following times when the surprise index was highest." "Today’s trough puts the index in the lowest 8% of readings. This is unusual given stocks are within spitting distance of all-time highs, despite softer-than-expected economic reports." "The possible reason for this revolves around the Federal Reserve, which may be just months away from raising interest rates for the first time in nine years. News that is disappointing enough to sow doubt in rate setters’ minds without signaling a recession is seen as ideal for stock prices." 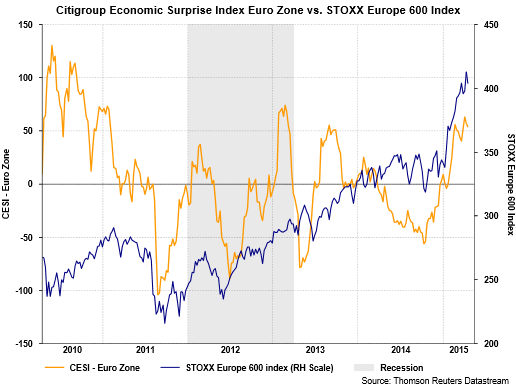 Further, the CESI for the Euro Zone has been counter to that of the U.S., that is, economic data reports have been exceeding strategists' expectations and the Euro STOXX 600 Index has responded positively. We have commented frequently with clients about the recent need to hedge the exposure to the the Euro versus the US. Dollar in order to protect returns generated in the Euro currency. "Jack Ablin, chief investment officer of BMO Private Bank in Chicago, said he pays attention to the surprise indexes as a way to gauge when a particular national economy may be turning and looks for good value in equities. It is an early indication of a momentum shift," he said, "adding that he's been raising the amount of money put into international stocks. 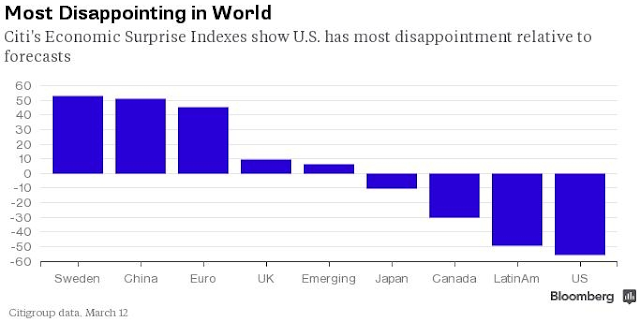 While Ablin expects moderate U.S. growth, he said a strong U.S. dollar has the potential to dampen the expansion." Interestingly, the Economic Surprise Indices readings could be suggestive of a market environment that is broadly favorable for a number of global equity markets. The desire by the U.S. Fed to get rates off the near zero level and data that pushes this further into the future and conversely, a number of central banks outside the U.S. pursuing quantitative easing measures, both can be positive for global equity markets. 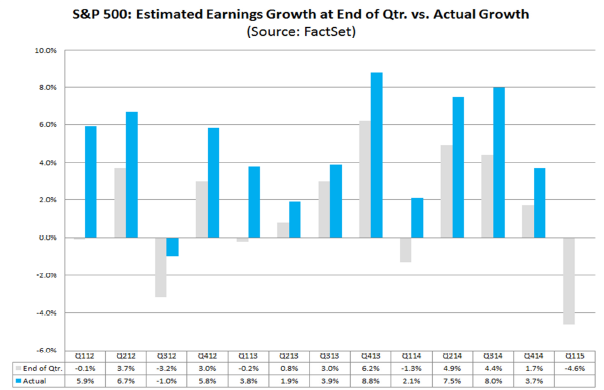 With first quarter 2015 earnings season beginning to hit full stride in the coming two weeks, earnings growth expectations for Q1 2015 are now negative at -4.6%. The last negative quarterly growth result was Q3 2012 as can be seen in the below table from Factset. Out of the small percentage of S&P 500 companies that have reported to date, 70% have cited the strong Dollar as the cause of their negative Q1 2015 report. As noted at the beginning of the article, the last negative earnings growth quarter occurred in Q3 2012. Importantly, these earnings reports are reflective of past results and investors will want to pay attention to forward guidance. Subsequent to the Q3 2012 negative growth quarter, the S&P 500 Index went on to generate outsized gains of 30% in 2013 as can be seen in the below table. "During the course of the first quarter, the dollar strengthened relative to the euro. On December 31, one euro was equal to $1.21 dollars. On March 31, one euro was worth about $1.07 dollars." "The dollar has also strengthened relative to year-ago values for both the euro and the yen. In the year ago quarter (Q1 2014), one euro was equal to $1.37 dollars on average. For Q1 2015, one euro was equal to $1.13 dollars on average. In the year-ago quarter (Q1 2014), one dollar was equal to $102.76 yen on average. For Q1 2015, one dollar has been equal to $119.17 yen on average." Lastly, it should be noted the earnings and revenue expectations from the energy sector are a significant contributor to the Indexes overall decline in earnings and revenue growth. We believe, though, the lower energy prices are a net plus to the economy via the benefit the consumer receives from lower energy prices. The first quarter reports almost seem like a replay from the first quarter of 2014 when weather across the country was a significant drag on economic growth. In Q1 2015 we had weather effects as well. On top of the weather, the West Coast Port shutdown also negatively impacted the retail segment. For investors, hearing forward guidance comments from the conference calls this quarter will be important in ascertaining future earnings expectations. As investors seem to be expecting an increase in interest rates by the Fed to be pushed out later this year, the emerging market trade has seen a positive impact relative to its U.S. developed counterpart. As the below chart shows, on a year to date basis the iShares MSCI Emerging Markets ETF (EEM) has moved up 9% versus the S&P 500 Index return of 2%. 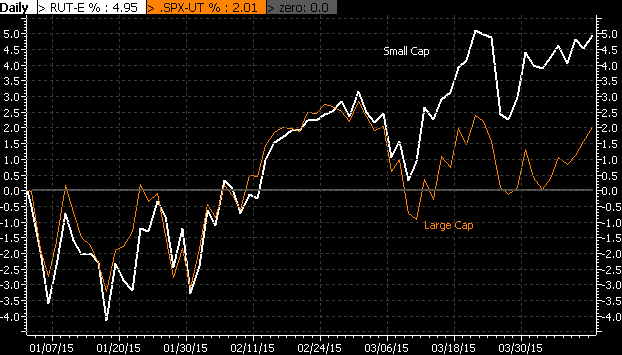 This risk on appetite has carried over into small cap stocks as well. Year to date the Russell 2000 Index is up 5% versus the previously noted 2% for the S&P 500 Index. These are a couple of divergences we mentioned in a post at the beginning of 2015 that the market would need to address, A Market Needing To Resolve Divergences In 2015. Lastly, on a longer term basis, Dollar strength has historically been a headwind for emerging market investors. 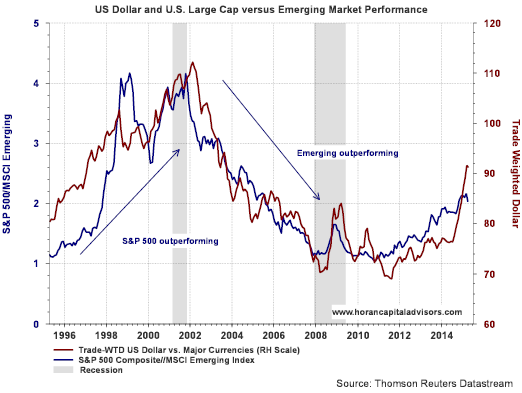 Maybe the rate increase cycle begins later this year; however, when it does, downward pressure could face emerging market investments as the rate increase nears. Through the first quarter of 2015, performance would suggust it was a good time to be a non dividend payer stock. As the below table shows, the average return of the non-payers generated a return of 6.49% versus the payers average return of 1.16%. 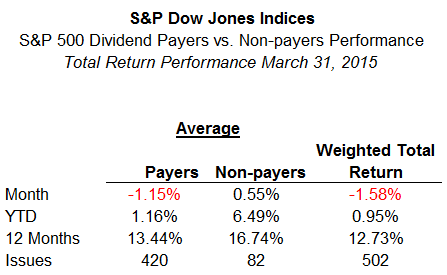 I would note, however, the average return in the quarter for both the payers and non-payers exceeded the cap weighted return of the overall S&P 500 Index.